The role of Business Administration is increasing day by day. Every organization is concerned about the competency of their executive. To execute the duty and responsibility in efficient way and to cope with the technological advances in industrial and commercial development in this fast growing global environment, the ability and capability of the executive must be enhanced. The purpose of this program is to prepare students in such a manner so as to enable them to meet any challenging situation and to work with competence in the competitive business environment. Bank is the core of the modern economy. Banking industry is moving faster and changing rapidly by offering new services continuously and consolidating into much large and complex business adopting new technologies that seem to change faster than most of us can comprehend and facing a new and changing set of rules to regulate and supervise the banks that serve their citizen. While preparing the report, I had a great opportunity to acquire a minimum knowledge of banking activities of IFIC Bank Limited. The objectives of the study are summarized in the following manner. To discuss the consumer credit policy of IFIC Bank. To assess the performance on consumer credit scheme. To make an overview of recovery of loan under consumer credit scheme. As I am a student my scope was very much limited and restricted. I had maintained some official formality for the collection of data of my report. This study basically focused on the loan and advance and consumer credit scheme of IFIC Bank Limited. IFIC Bank Ltd. is a large Bank and it facilities various products and services, this study covers prudential guidelines of loan disbursement and there performance on credit handling. The report is prepared on the basis of credit program of IFIC Bank Ltd. Different files; statements and manual have helped me preparing this report. The subject matter of this report is based on secondary sources of data and information. Annual reports of IFIC Bank Ltd.
Periodicals published by Bangladesh Bank. Various books, Training articles, compilations etc. regarding general banking functions and credit policies. Monthly closing affairs of Kawran Bazar branch IFIC Bank Ltd.
Website of IFIC Bank Ltd. Following the Introductory Chapter (Chapter-1) contains that background of the study, objectives, scope, limitation and an overview of the organization ( IFIC Bank ). Chapter-2 provided study about loans and advances, Small Enterprise Financing, Consumer Financing, About Credit Administration Department, Credit Policies & practices, Policy Objectives, Lending Guidelines, Data analysis & interpretations, Credit approval & recovery process. Chapter-3 contains that the performance analysis of consumer credit scheme such as Net Interest Margin, Provision for Loan Losses Ratio, Loan Ratio, and Interest Expense Ratio. Chapter-4 provided the study on SWOT Analysis, Findings, Recommendation for Improvement, and Conclusion. Learning all the banking functions within short time is tough. One of the main barriers in written this report was Insufficiency of necessary information and data because this report is written based on secondary data..
IFIC Bank Ltd is not furnished with adequate written document related to this report as a first generation private bank in Bangladesh. International Finance Investment and Commerce Bank Limited (IFIC Bank) is a banking company incorporated in the people’s republic of Bangladesh with limited liability. It was set up at the instance of the Government in 1976 as a joint venture between the Government of Bangladesh and sponsors in the private sector with the objective of working as a finance company within the country and setting up joint venture banks/ financial institutions abroad. The Government held 49 percent shares and the rest 51 percent were held by the sponsors and general public. In 1983 when the Government allowed banks in the private sector, IFIC was converted into a commercial bank. The Government of the People’s Republic of Bangladesh now holds 32.75% of the share capital of the Bank. Leading industrialists of the country having vast experience in the field of trade and commerce own 34% of the share capital and the rest is held by the general public. IFIC was established, at the instance of the Government, with primary objectives of carrying a banking business abroad through subsidiaries, affiliates and branches and investment and financial business in the country. During the mean time in May, 1979, IFIC secured permission of the Bangladesh Bank to function as a Merchant Bank in the country. This is the survival unit of a bank because until and unless the success of this section is a question to every bank. If this section is not properly working, the bank it self may become bankrupt. This is important because this is the earning unit of the bank. Banks are accepting deposits from the depositors in condition of providing interest to them as well as safe keeping their deposits. Now the question may gradually arise how the bank will provide interest to the clients and the simple answer is advance. To run operations and to earn profit thereby every bank advances and invests its deposited money and reserves equity and other available funds in various profitable sectors. The effectives and profitable policies concerning advancing and investment are needed increasingly without proper mobilization of deposits under the shadow of advances and investments, no bank can exists. In the area of investment and advancing IFIC Bank Limited stand among leaders of private commercial banks of the country. Advances are the main revenue generating area for any bank. But a commercial bank cannot advances all of its deposits and Bangladesh Bank governs the rules that a maximum of 80 percent of total deposit can be advanced to the clients. The rest 20 percent of the total deposit has to be kept in the Bangladesh Bank as government policy. IFIC bank ltd has extended its advance facilities for the past years with the policy guidelines of Bangladesh Bank. 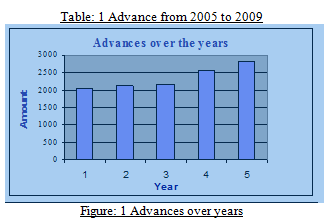 In 2000 total advances was 1731.28 crores whereas the amount reached 3236.15 in the year 2009(appendix 1). A Manufacturing concern with total assets at cost excluding land and building from TK. 50000 to TK. 1 Crore. The purpose of this section is to provide direct loan guidelines to the branches for providing consumer financing under consumer Finance Scheme. Guidelines under the prudential Regulation and Direction of Bangladesh bank have been formulated. These guidelines will assist the branches as to how the CCS loan port-folio should be managed. The committee studied existing products available in the market. Considering the market demand and investment opportunities in Consumer Financing Sector, the committee has formulated the following 7 (seven) products launched under Consumer Financing Scheme Easy loan (Secured Personal loan). 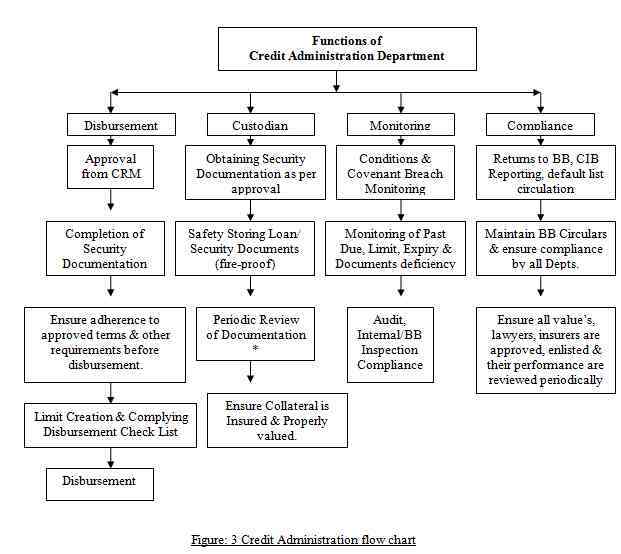 The credit Administration function is critical n ensuring that proper documentation and approvals are in place prior to the disbursement of loan facilities. For this reason, it is essential that the functions of Credit Administration be strictly separated from relationship Management/ marketing in order to avoid the possibility of controls being compromised or issues not being highlighted at the appropriate level. Loan Size Maximum TK. 50,00,000 only. Customers of the respective branch giving shop/ business place in the command area with at least 2 (two) years experience on their line of business. Rate of interest @14.50% p.a. with quarterly rest or received from time to time. Guarantee Customer legal property or financial obligations are treated as guarantee. Target Customer Business Enterprises (other than public limited company ) engaged in manufacturing and trading business. Loan Amount Maximum TK. 50,00,000 only. Eligibility Any business house in the command area having at least two years experience in their line of business. Target Customer Individual, Business Enterprises (other than public limited company) having commercial plot. Rate of interest @15.00% p.a. with quarterly rest or received from time to time. Processing Fee TK. 2000 to be realized before disbursement of loan. Loan Amount Maximum TK. 1.00 lac. Eligibility Any small and retail business house giving valid trade license and must gave an account with IFIC Bank Ltd. Processing Fee 1% on loan amount to be obtained as service charge. Target Customer Individual/Proprietorship firm engaged in retail business. Personal Guarantee Required Yes, One personal guarantee is required. Loan Size Maximum 95% of the face value of FDR. Face value would mean the original amount for which the FDR was issued or the amount renewed. Rate of interest Varies from 11.00% to 16.00%. FDR with IFIC Bank Ltd.
Demand shares of A & B category companies traded in DSE & CSE. Age 25 to 60 years. Employees of Govt./semi Govt./Corporation/Autonomous bodies. Employees of reputed NGO/Aid agencies. Other salaries persons acceptable to the bank. Rate of interest 16.50% p.a. with quarterly rest or as revised from time to time. Processing Fee TK. 1000 to be realized at the time of disbursement ofLoan. Age 25 to 65 years. Eligibility Customer must have an account with IFIC Bank. Processing Fee TK. 5000 to be realized at the time of disbursementof loan. Rate of interest @15.50% p.a. with quarterly rest or as revised from time to time. Processing Fee TK.2000 to be realized at the time of disbursement of loan. One copy passport size photograph. One copy passport size photograph of proprietor/partner/managing director as well as guarantors. CIB report of the borrower. Up to date rent paid receipt of the shop. Personal net worth statement Letter of arrangement. Memorandum of deposit of cheque. Letter of authority for collection of proceeds from issuing branch/ Bank. Registration of the vehicles in the name of the owner with HP clause as per Hire Purchase Agreement. Cost of insurance & proportionate registration fees to be deposited along with equity proportion at the time of application. Maximize Bank’s earning from loan portfolio. Utmost emphasis on loan sanctioning is to be given in order to improve quality of the oan portfolio. Credit facilities are to be considered solely on viability of business/ enterprises/ project/ undertaking having adequate cash flows to adjust the loans, and management capacity of the borrower to run the business profitably. Evaluate credit risks before sanctioning, which may hamper generation of the projected cash flows of the borrower and might delay or hinder repayment of Bank’s loan. Monitor continuously performances of the financed projects/ business/ enterprises will be Bank’s main thrust for ensuring repayment of the loan, and receiving early warning (EL) for taking timely corrective measures. Price the loans on the basis of loan pricing module of the Bank focusing on risk rating of the borrower. Strict obedience to Bangladesh Bank’s policy guidelines. Bank’s Credit Strategy will be invigorating loan processing steps including identifying, measuring, containing risks as well as maintaining a balance portfolio through minimizing loan concentration, encouraging loan diversification, expanding product range, streamlining security, insurance etc, as buffer against unexpected cash flow. The total credit facilities by a bank to any single person or enterprise or enterprise or organization of a group shall not at any point of time exceed 35% of the bank’s capital subject to the condition that the maximum outstanding against fund based financing facilities (funded facilities) shall not exceed 15% of the total capital. Non-funded credit facilities, e. g. letter of credit, guarantee etc. can be extended to a single large borrower. But under no circumstances, the total amount of the funded and non-funded credit facilities shall exceed 35% of bank’s total capital. However, in case of export sector, single borrower limit shall be 50% of the bank’s total capital. But funded facilities in the form of export credit shall not exceed 15% of the total capital. Loan sanctioned to any individual o enterprise or any organization of a group amounting to 10% or more of bank’s total capital shall be considered as large loan. In order to determine the above maximum ceiling for large loans, all non-funded credit facilities e.g. letter of credit, guarantee, etc., shall also be considered to arrive 50% credit equivalent. However, the entire amount of non-funded credit facilities shall be included while determining the total credit facilities provided to an individual or enterprise or an organization of a group. A Public Limited Company, which has 50% or more pubic shareholdings, shall not be considered as an enterprise/ organization of any group. In case of credit facilities provided against government guarantees, the aforementioned restrictions shall not apply. In the cases of loans backed by cash and encashable securities (e.g. FDR), the actual lending facilities shall be determined by deducting the amount of such securities from the outstanding balance of the loans. Banks shall collect the information on their borrowers from credit Information Bureau (CIB) of Bangladesh Bank before sanctioning, renewing or rescheduling loans to ensure that credit facilities are not provided to defaulters. Banks shall perform Credit Risk Grading (CRG) before sanctioning or renewing large loans. If the rating of CRG turns to be “marginal”, a bank shall not sanction the large loan, but it can consider renewal of an existing large loan taking into account other favorable conditions and factors. However, if the result of CRG is unsatisfactory, neither sanction nor renewal of large loans shall be considered. While sanctioning or renewing of large loan, a bank shall assess borrower’s overall debt repayment capacity taking into consideration the borrower’s liabilities with other banks and financial institutions. A bank shall examine its borrower’s Cash Flow Statement, Audited Balance Sheet, Income Statement and other financial statement to make sure that the borrower has the ability to repay the loan. Logging, Mineral Extraction/ Mining or other activity that is ethically or environmentally sensitive. Bridge Loans relying on equity/ debt issuance as a source of repayment. Maximum 50% of Bank’s total capital for export sector. (Funded facility shall also not exceed 15% of Bank’s total capital). the cash flow of the business. A smooth flow of cash in the business requires efficient management competence in conducting the business in a given market. However as the market never remains stable owing to various uncontrollable factors, the continuity of well managed business cash flow is difficult to visualize in the long run. As such to ensure realization of Bank’s finance in case of any eventually, other adequate security coverage deemed necessary with a view to protect interest of the Bank. Overdue principal and interest (Monthly). Breach of loan covenants/terms and conditions/Documentations deficiencies (Fortnightly). Non-Receipt of Financial Statements in time (Annually). Objections of internal/external or regulator Inspection/Audit and advice corrective measures timely. Details of Early Alert Accounts and preparation of list of delinquent account and special mention account (SMA). (Monthly). Identification of early alert accounts, delinquent account and special mention account (SMA). (Monthly). Identification of the account, which shall be SMA status due to non-renewal. (Monthly). Listing of the accounts, which shall be SMA if not renewed with in 3 month and taking necessary measures. (Monthly). Ensuring renewal of limits 2 months ahead of expiry dates. To find out the contribution level of CCS on overall performance of banks through identify the profit generate from CCS. So far the table is concerned; the demand of the loan is increasing for all banks except IFIC Bank Ltd in successive years. The total interest income generated from CCS is decreasing year by year. It is needed give concentration on consumer credit scheme as it is one of the most demandable sectors for banks now a day. To determined the demand of CCS by analyzing the growth of disbursement amount of loan under CCS. To analyze this specific objective data was collected through a survey. Under this survey amount of loan disburse under CCS for the year 2007, 2008 and 2009 are collected from 6 banks. IFICBL SJIBL Prime Bank Ltd. Mercantile Bank Ltd. Uttara Bank Ltd. AB Bank Ltd. In the 3 year slab, we can interpret that yearly disbursement increasing except IFIC Bank Ltd. In terms of recovery against disbursement is different for each bank, and varies from 90%-98%. Amount of disbursement under the scheme is one of the vital factors to judge the strong position in CCS program. So to find out the extent of a bank in the CCS program we should consider the amount of disbursement and rate of recovery of the selected banks for the last three year. From the following table we see that the amount of disbursement is increasing gradually that means contribution of Consumer Credit on overall performance of banking sector also is increasing gradually. But the position of IFIC Bank ltd is different here. The market growth is increasing but the IFIC experiences negative growth for CCS loan. As a result the interest income from CCS loan is decreasing as shown in specific objective one. To observe, whether the loan outstanding and growth of loan outstanding keep phase with similar position competitor. To analyze this specific objective loan outstanding data was collected from the annual report of IFIC Bank Ltd and National Bank Ltd from 2003 to 2007. Both the bank here is analyzed are the first generation private bank in our country. Analyzing the above collected data it is seen that both the bank is in increasing position in case of loan disbursement. But the growth rate was so high for National Bank in 2004 than IFIC Bank. But in recent year it is observed that the growth rate of loan outstanding almost similar. So it can be said that IFIC Bank has recovered it loan growth position and running business with its nearby competitor. Proposal forwarded by RM (Branch Manager) to Head of Corporate & Marketing in duplicate. 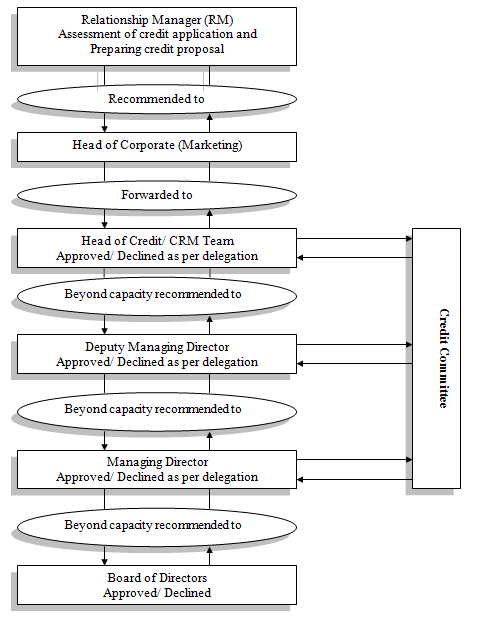 Head of Corporate will in turn recommend the proposal to the Head of Credit Risk Management. HOC/ CRM Executives advise the decision as per delegated authority to RM (Branch Manager). HOC supports & forwards to Deputy Managing Director. Deputy Managing Director advises the decision as per delegated authority to HOC. Deputy Managing Director support and forwards to Managing Director. Managing Director advises the decision to Deputy Managing Director/ Head of Credit. Managing Director presents the proposal to Board. Board advises the decision to Managing Director. Any declined credit may be re-presented to the next higher authority for reassessment/ approval through HOCB. However, there should be no appeal process beyond the Managing Director. The Recovery Division at Head Office would directly manage accounts with sustained deterioration (a risk Rating of Sub Standard (6) or worse). Accounts graded 4-5 shall be transferred to the Recovery Division for efficient exit based on recommendation of CRM and Corporate Banking. Whenever an account is handed over form Relationship Management to Recovery Division, a Handover/ Downgraded Checklist shall be completed. Net Interest Margin measures the net return on the bank’s earning assets. Here net interest means interest income after interest paid on deposits and borrowings. The following table shows that the net interest margin is in increasing or almost stable position in last three years. The net interest margin ratio of others first generation private bank say National Bank Ltd it was 2.96% in 2007. It is little a bit short in comparison with other private banks in our country. This ratio measures the proportion of total operating income that goes to pay for the investment loss. That means the percentage of provision for loan losses against total loan. The ratio is showing decreasing trend this may happen because of recovery rate. The rate is high in recent years. The loan ratio indicates the extent to which assets are devoted to loan as opposed to other assets. From the following table it is easily observed that the loan ratio more or less similar in successive years. Bangladesh bank has already fixed up the lending caps in different sectors and identified sectors to which lending amount should grow and to which to maintain. Agricultural sector of Bangladesh is getting support. Market and Govt. pressure for lowering the interest rate. The growth rate of competitor banks is very high. Bangladesh Bank exercises strict control over credit activities. The City Bank Limited has been performing very well. No doubt, this is the sign of good management. However, the credit appraisal and proposal system of The IFIC Bank is said to the best one in this kind certain factors are overlooked. Lack of monitoring of credits. In credit appraisal system, the competitive position analysis is not focused while doing the appraisal system. On a priority basis the technical problem faced by the branches everyday because of new online system could be solved. This problem can be solved by giving proper training to the employees. To run operation sound, the bank can bring all branches under online as soon as possible. Moreover already onlined branches still using traditional register book. IFIC Bank could diversify the product. It should try to introduce more attractive lending and savings scheme to its Premium customers to create more business for the Bank. The Bank can pay more attention to this segment of customers, as it is the most solvent group from which income can be generated if the package is designed properly. 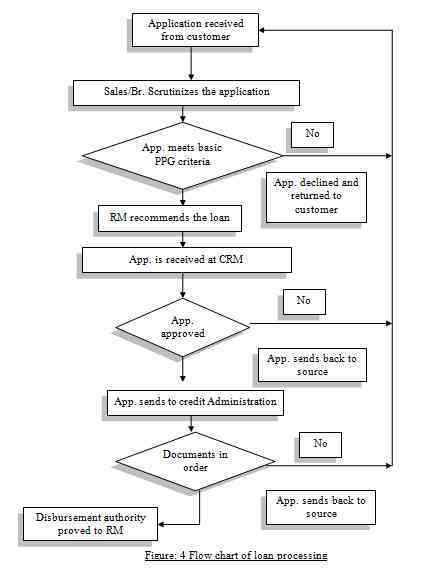 The loan processing complexity could be relaxed. The dependence on head office for loan processing could be lessened. The demand for CCS is increasing in our country, but the scenario is different for IFIC Bank Ltd. The loan amount under CCS is decreasing. So steps could be taken to improve CCS loan to run in the competitive field. Monitoring of a loan should be conducted at regular interval. The core part of Bank management is Credit management. The existence of a bank depends on the credit management. Because if credit management fails to have a well-diversified loan portfolio than the bank may lose all its investments which are the savings of the depositors and owners’ equity. The Credit management does all sorts of the activities regarding the loans and advances. The mission of IFIC Bank Ltd. is to provide service to its clients with the help of a skilled and dedicated workforce whose creative talents, innovative actions and competitive edge make its position unique in giving quality service to all institutions and individuals that they care for. But their workforce is not enough skilled to fulfill its mission. The other major drawback of IFIC Bank as the leading first generation private is inadequate technical support. Recently they has taken a new project with ‘MYSIS’ International Banking System Inc. (UK) to further upgrade its banking operation to state-of-art world class on-line banking solutions to provide faster and even more convenient centralized services to the clients. Introducing online banking among the branches allover the country is a good step for running business in a competitive environment. To run banking operation sound in competitive environment along with the world wide economic recession more care ought to taken in loan sanction. The prescribed rules by Bangladesh Bank could be a good measure for granting credit to clients.